During the early summer back in 2015 I found that a few leaves of my backyard grape vines were covered with colorful galls. 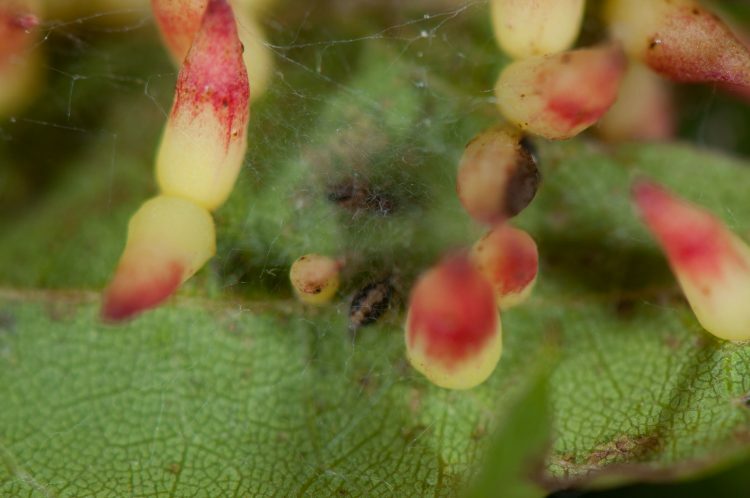 After some research, I identified these galls as “grape tube galls” which were likely created by Cecidomyia viticola (AKA Schizomyia viticola) a tiny fly. 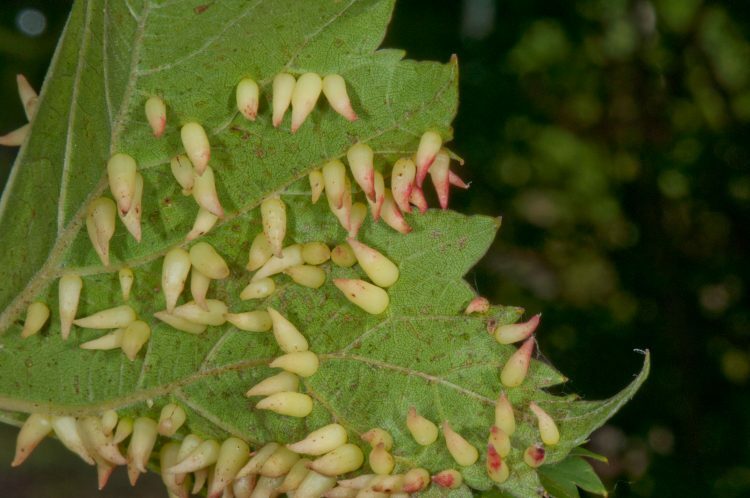 The gall growth is stimulated by the developing fly larva within the plant tissue. Some species cause significant damage to the host plant, but in this case only a few leaves were affected, and any damage to my grape vine was insignificant. In my opinion the galls were very beautiful. 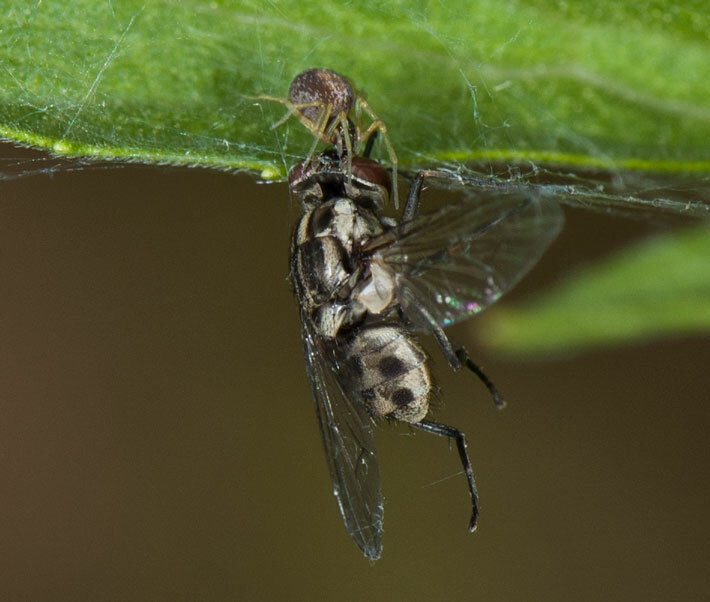 As I was admiring the galls, a small flower fly (Syrphidae) landed on the edge of the leaf. 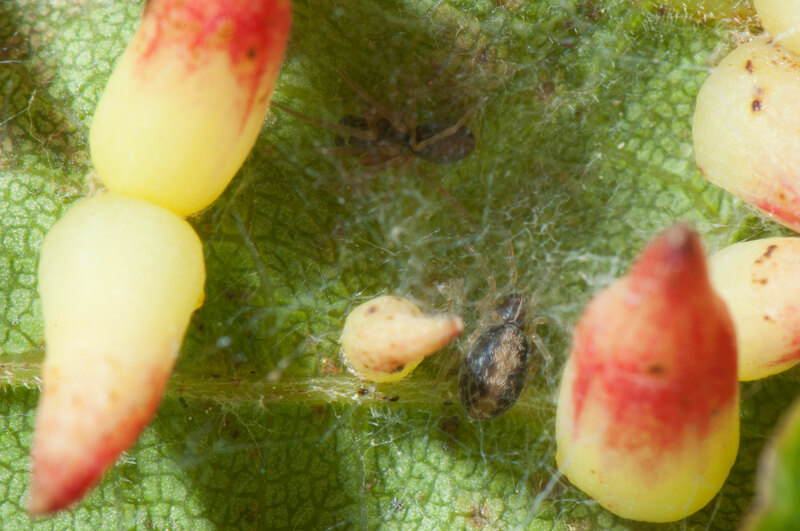 When I bent down to examine the tubes closely, I found spiders among the galls! Some small spiders build their webs in the spaces created by curved leaves. 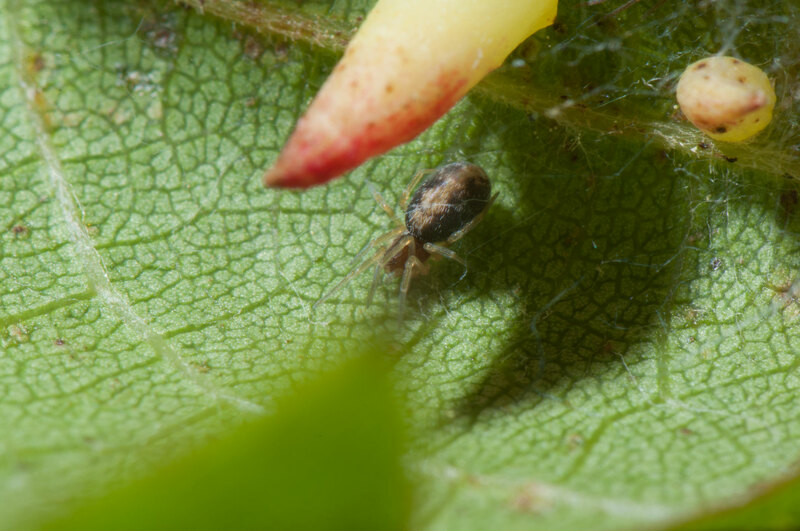 In this case, hiding below the thin whispy webbing stretched between the tube galls on my grape leaves were tiny brownish spiders. I recognized them as meshweavers (family Dictynidae). 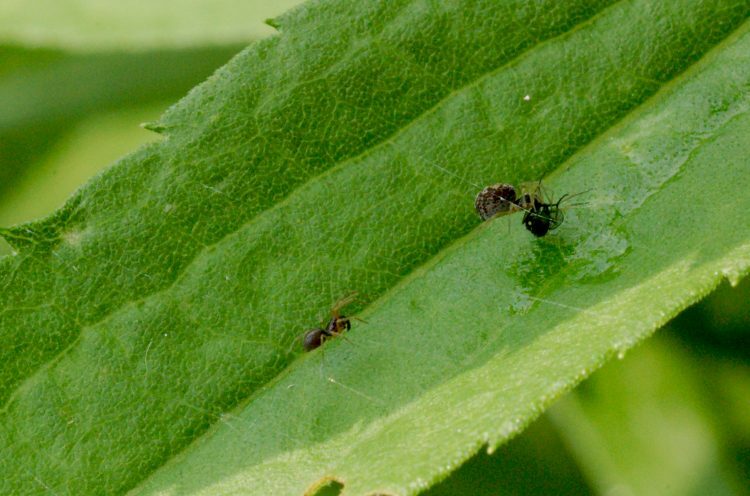 There are two species of meshweavers in my yard that I have found building very thin webs on the surfaces of leaves. 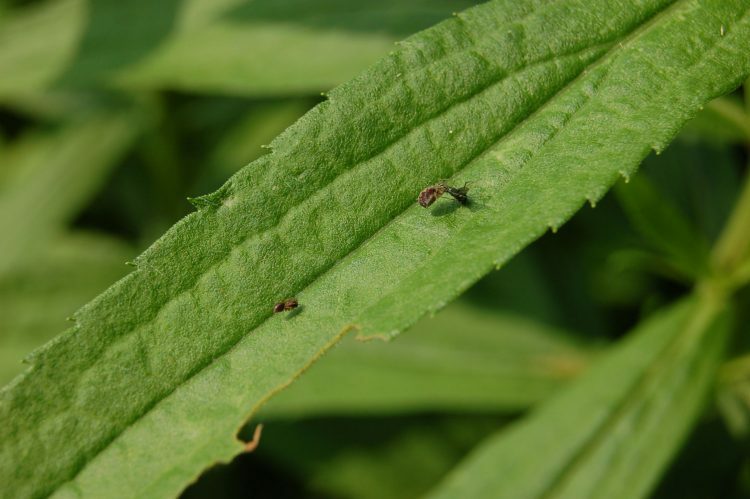 These two species Dictyna foliacea and Emblyna sublata are quite similar in appearance. 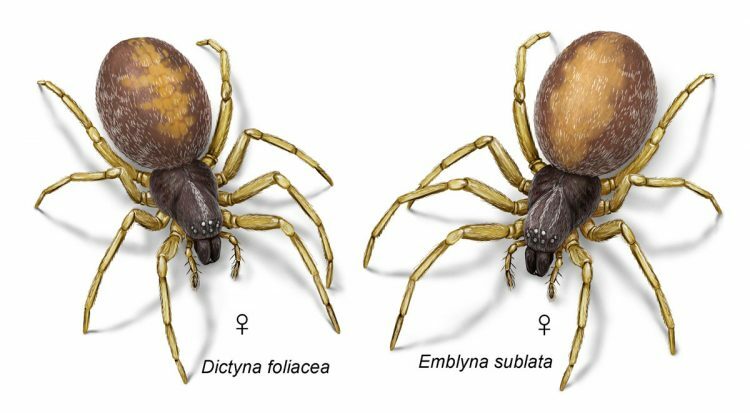 They are both small brownish spiders, in the females there is a light yellowish or orange colored folium (central stripe) on the abdomen. One way to distinguish these females is a difference in the markings on the cephalothorax (head region). In Dictyna foliacea there is usually a single stripe of white hairs, in Emblyna sublata there are usually three separate white stripes of white hairs (sometimes more). Both of these two species of meshweaver females are illustrated in my book (Plate 21) and I include those paintings by Steve Buchanan below. 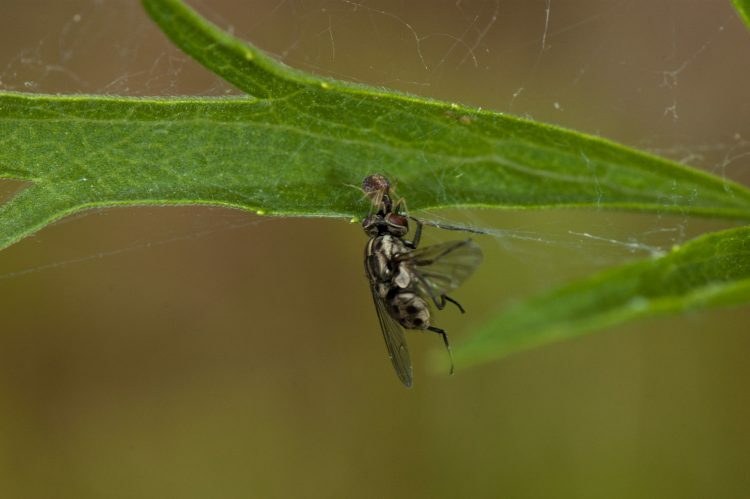 In this situation among the galls the residents were a pair of tiny meshweavers (Dictyna foliacea). This spider seems to prefer the leaves of herbaceous plants in fields and brushy areas. I usually encounter them on the upper surfaces of goldenrod or other plants in our home prairie patch. 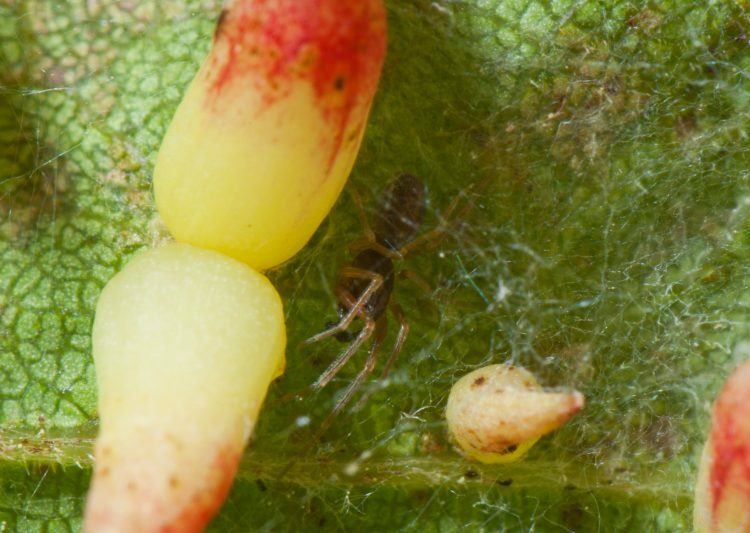 The grape leaves with tube galls provided a convenient substrate for their web. Perhaps the flash from my camera, or the fact that I was hovering very close to the leaf, stimulated the spiders to move. Here are photos of the male, and the female after they moved at least a bit more into the open. 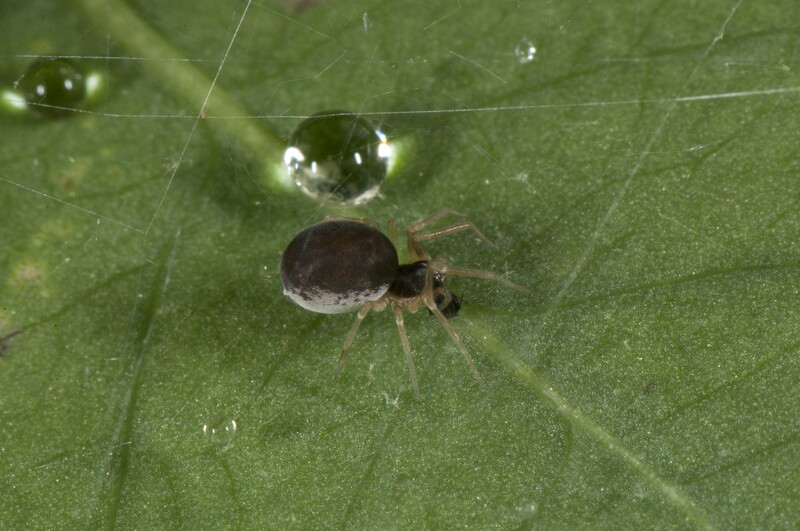 Here (below) is a photo of the similar looking meshweaver Emblyna sublata in her web atop a leaf. These photos were taken during a bio-blitz in May of 2015 at a nearby park (Shale Hollow Park). 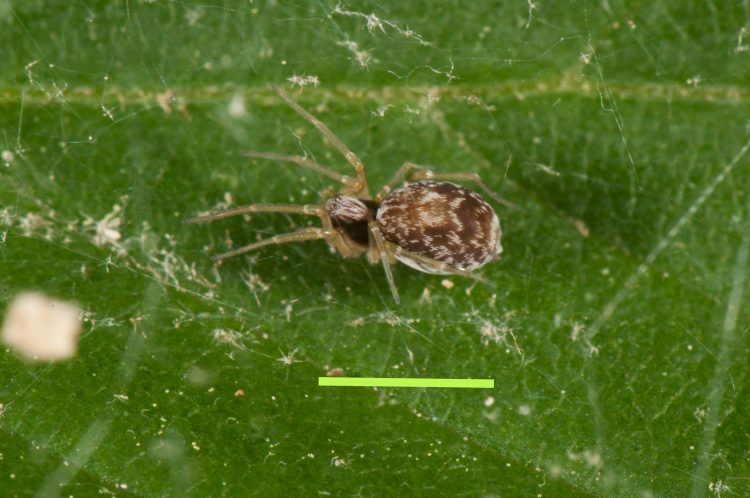 Notice that she has more white hairs on her cephalothorax (head region) than Dictyna foliacea. Here (below) is another individual of Emblyna sublata photographed on at the same location and time as the photograph above. She is an extremely dark colored individual with a very fat abdomen (probably full of developing eggs). She is busy eating. Here is another photograph taken on the same day showing another pair, male and female meshweavers (Emblyna sublata) in their nuptial web. In many cases, pairs of spiders have been found cohabiting the space under the web. On one occasion while wandering in my yard I found a male with a fly prey. By the time I returned with my camera, the fly had been transferred to the female. Perhaps the male offered her the fly as a nuptial gift. This sort of behavior is known for some spiders, but I was unaware that meshweaver males provided nuptial gifts. Or perhaps the larger female just stole the fly from the male. A slightly closer view of the same pair. 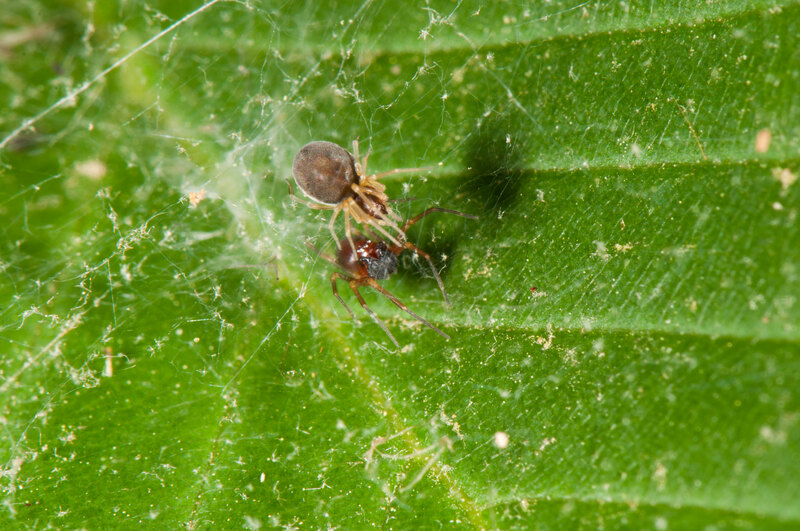 Even tiny meshweavers such as these can sometimes capture prey that seem huge in comparison to the spider. On June 17, 2008 I found a female meshweaver (Emblyna sublata) with a fly that was very much larger than the spider. In this case she has bitten the fly near the base of the antennae, maybe this is because there is soft flexible cuticle on the fly at this position; making it easier for the tiny fangs of the spider to penetrate the exoskeleton of the fly. Here is a closer view. There always seems to be something going on in our small back yard, all I need to do is to slow down and pay attention. 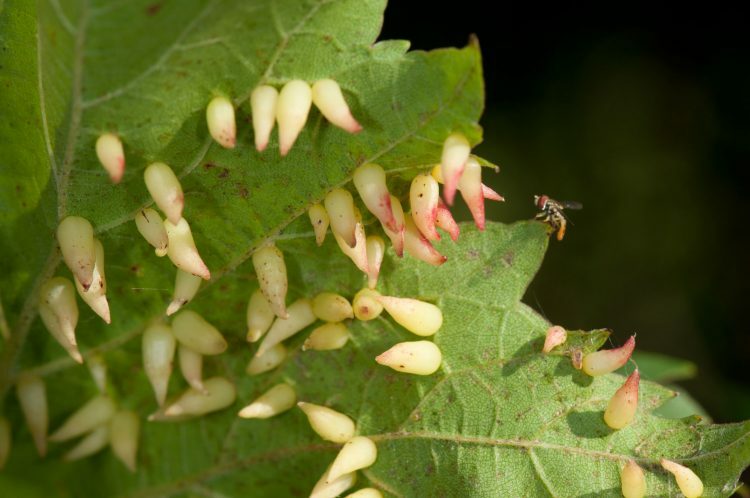 As I write this post it is winter, but I can still recall that early summer morning, when finding colorful galls on the leaves of my grape vines led me to an adventure observing meshweavers. Rich, Most interesting meshweavers and especially cool to see the size difference between the spider and the fly! Those flies need to be worried, very worried! I need to slow down and look more closely!